A conspiracy drama, Michael Clayton is a cerebral thriller focusing on the underbelly of big corporate machinations in the era of globalization. 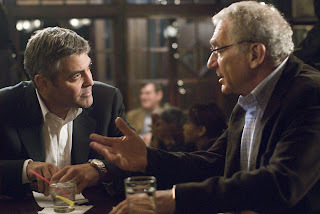 Michael Clayton (George Clooney) is a fixer on contract with a large New York corporate law firm run by Marty Bach (Sydney Pollack). Michael's job is to make bad news stories go away for the firm's clients. Michael is also recovering from a severe gambling problem and is trying to get away from the rat race, but his attempts to start a restaurant business backfire. Nearly bankrupt, he is under pressure to come up with a lot of money, and fast. With Bach and his team leading a settlement conference representing the interests of large agricultural firm uNorth, Michael narrowly escapes an assassination attempt while on an upstate business trip. He is forced to take stock of what exactly is going on at the law firm. Four days earlier, Michael was called to Milwaukee to deal with a crisis precipitated by senior lawyer Arthur Edens (Tom Wilknson) suffering a mental breakdown during a deposition. Arthur was the lead lawyer on the uNorth case, defending the firm against a class-action suit involving allegations of poisoned soil on small farms. uNorth's ruthless internal general counsel Karen Crowder (Tilda Swinton) is not impressed with Arthur's disintegration, and even less impressed with Michael's pragmatic reaction to the crisis. Michael starts to investigate what may have pushed his friend Arthur over the edge of sanity, while Karen sets in motion an alternative plan to save her firm's reputation. 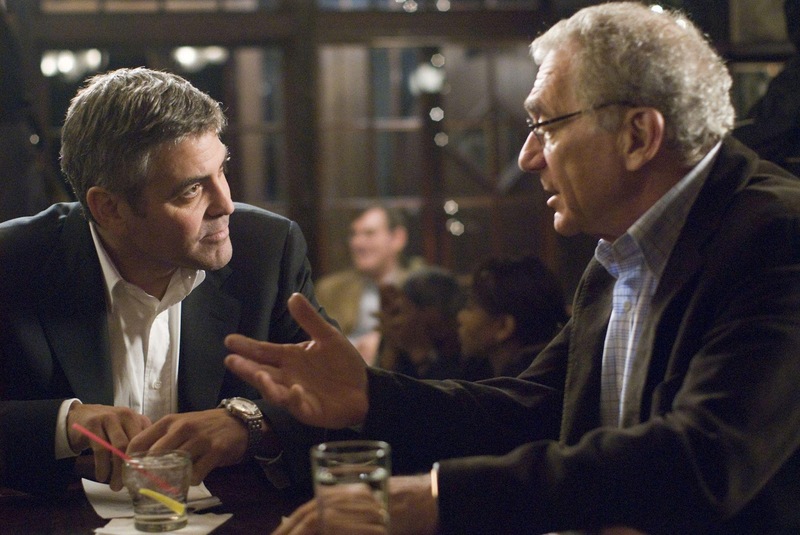 Directed and written by Tony Gilroy, Michael Clayton is slick, cool and intellectual. Despite no shortage of criminal activity up to and including severe physical harm, the story is intended to stay just on the right side of grounded, with enough careful credibility to keep the narrative within plausible limits while also serving up excellent entertainment. Michel Clayton demands concentration and rewards it handsomely. This is a film where scenes are sometimes joined mid-stream, while others appear to truncate early. Nothing is over-explained; the threads are laid out slowly, carefully, but not necessarily in an easy-to-weave pattern. All the events take place over just a few hectic days, but the subtle shift in perspective that occurs in starting near the climax and then drawing back to a few days prior achieves the desired unhinging effect. Gilroy reveals his secrets on his own terms and according to his chosen pace, and the pay-off is immense. Once the conspiracy starts to take shape it all makes sinister sense, and the events are all driven out of a sense of knee-jerk desperation by corporate leaders wielding enormous power and pushing the envelope due to incredible strain. None of the characters have all the answers, plenty of loose ends remain beyond the reach of any tidying up, and the mess of corporate chicanery represents a familiar spiraling public relations disaster leaving many scattered victims in its wake. The story boils down to a battle of wills between Michael and Karen, and they only meet twice, at the beginning and end of Michael's ordeal. They are two deeply flawed individuals, wracked by insecurity. In Michael's case his failures are now almost fully public, his humiliation complete once he has to grovel for a loan from Marty. Karen's anxieties are more concealed, but Gilroy bores into her fragile psyche with astonishing scenes of Karen practicing her public persona in private, the general counsel able to hide her jitters from everyone except the woman in the mirror. George Clooney keeps his charisma wattage in check and delivers an understated performance, one of his most powerful and compelling screen achievements. Swinton gets fewer scenes but is equally magnificent, creating for Karen an icy exterior to conceal demons waiting to burst forth in all the wrong directions. Tom Wikinson and Sydney Pollack lend weighty veteran support, and Michael O'Keefe makes an appearance as another unapologetic shark in the corporate boardroom. 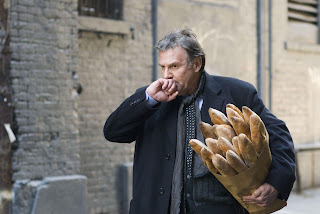 Michael Clayton is a rare example of a supremely smart thriller, where the battle lines are vague and the puppet masters may be hidden in business suits, but are no less lethal for it.